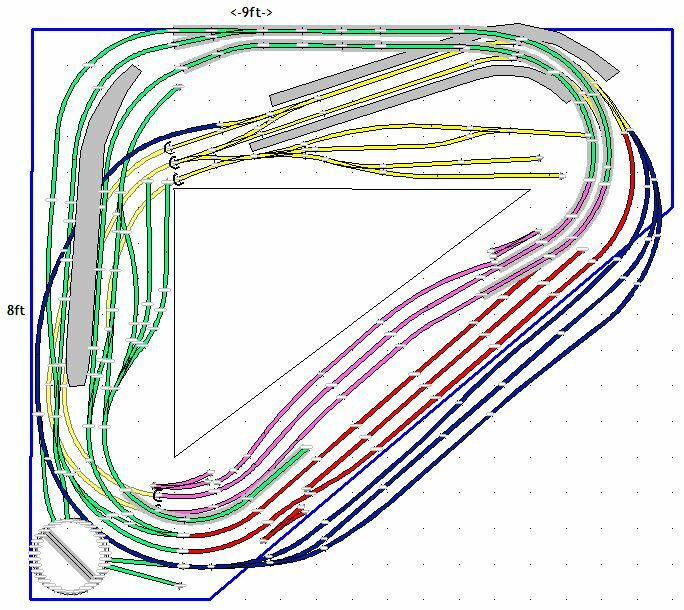 Following on from my initial deliberations on the Civil engineering in the playroom ( see here for the Track questions thread - https://www.newrailwaymodellers.co.uk/Forums/viewtopic.php?f=15&t=52110 ), I have started this thread as I think it has moved more into the planning stage now for the Uppy-Downy-Roundy-Roundy- Railway (UDRRR). 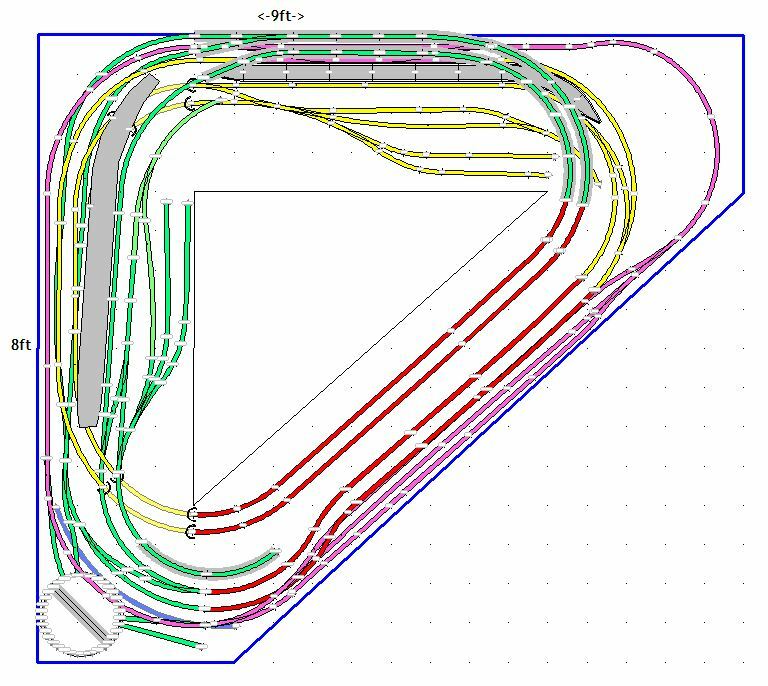 I have the current Trakmat layout up to test various bitsnbobs and I realised that one of the things the Small Controller really likes doing is "marshalling" as large a train as he can, and the UDRRR would not accommodate that. Points are all "out in the open", the Marshalling yard lines are flat ( unlike the loops on the inclines) so he can push wagons/carriages around to his hearts content to get as long a train as he can create. Any comments on the marshalling yard? – the “headshunt” is under the upper level (Green Track), I’d hope to use the Kirby method of uncoupling ultimately, but in the short term the Hornby uncoupling ramps will do the job fine. This weekend, its planned to start stripping trackwork off an old incomplete portable layout (that has been in the attic for nearly 20 years now), see what can be recovered and then order some of what I suspect will be essential for phase 1. I must empty the road trailer this weekend so that I can use it for the timber collection next weekend. Phase 1 is to build the lower level with a temporary circuit where the inclines will be, to test all the concepts and to reacquaint myself with my woodworking skills ( such as they were). Phase 2 ( the upper levels and inclines) would follow later – if ever. Also I keep having to remind myself that it is what I would term a "Hornby Railroad" layout - play is more important than realisim. Last edited by NedFlanders on Fri Dec 29, 2017 11:56 pm, edited 1 time in total. Looks good but it will need a lot of track to finish that plan! Go for it! That will be epic. I take it there is 2 lines doing the full figure 8? Small controller will love that! Do I take it that this is now going to be permanent? Handling that many joins on multiple levels would be very far removed from easy. The L will need to be able to be "deconstructed" should the need ever appear to need it to be out of the way, but the diagonals should be able to be removed "relatively" easily as we need room to be able to put up the pool table from time to time. With the entertainment we have both had with just the planning/preparation for this project I think Ratty put it well ( with all due deference to Kenneth Grahame ) "Nice? It's the only thing," said the Water Rat Solemnly, as he leaned forward for his stroke. "Believe me, my young friend, there is nothing -- absolutely nothing -- half so much worth doing as simply messing about in boats." - I believe the same can be held to be true for "messing about with trains" in my book! The plan is to lay the lower level "roughly" in place and join the two sets of Diagonal red lines to complete a mainline loop with an outer loop with two storage lines. I'm also thinking of making the outer loop into a dual control line for both dc and dcc with a suitable Doublepole doublethrow switch so that we can run some locos that have yet to be converted - that might be a bit dangerous with the Small Controller but I will see how it goes. I would like to see if I could put the lower station at an angle too but I think that might put some of the pointwork under the upper station which I wouldn't be in favour of. 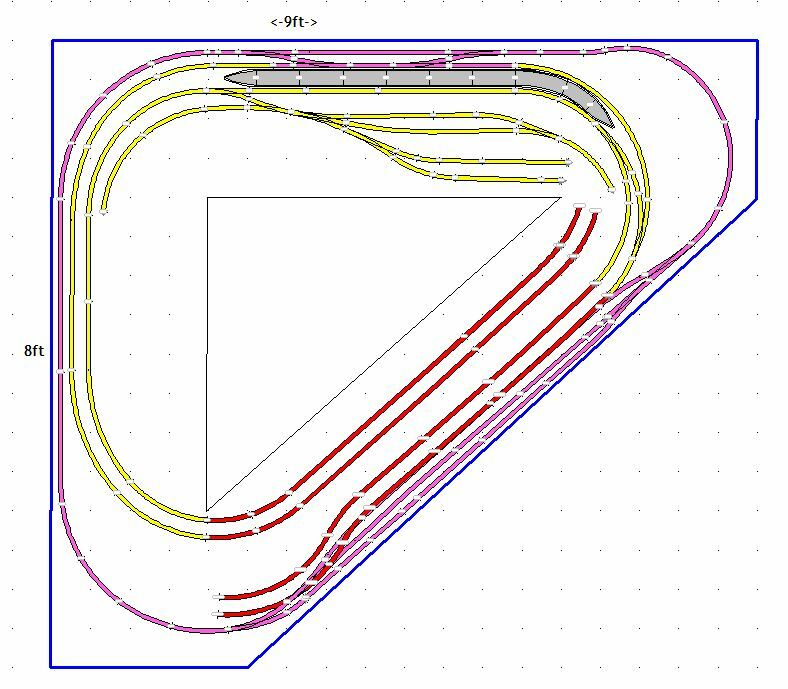 however, I think I have had enough of shuffling track on the computer so I will do the next set of shuffling in the real world - e.g the upper station south end curves may need to start 2-3 inches sooner etc. Hopefully over Christmas I will get a couple of lines laid so that the small controller will have some fun.